Regression equations to estimate peak streamflows with 1- to 500-year recurrence intervals (annual exceedance probabilities from 99 to 0.2 percent, respectively) were developed for small, ungaged streams in Maine. Equations presented here are the best available equations for estimating peak flows at ungaged basins in Maine with drainage areas from 0.3 to 12 square miles (mi2). Previously developed equations continue to be the best available equations for estimating peak flows for basin areas greater than 12 mi2. New equations presented here are based on streamflow records at 40 U.S. Geological Survey streamgages with a minimum of 10 years of recorded peak flows between 1963 and 2012. Ordinary least-squares regression techniques were used to determine the best explanatory variables for the regression equations. Traditional map-based explanatory variables were compared to variables requiring field measurements. Two field-based variables—culvert rust lines and bankfull channel widths—either were not commonly found or did not explain enough of the variability in the peak flows to warrant inclusion in the equations. The best explanatory variables were drainage area and percent basin wetlands; values for these variables were determined with a geographic information system. Generalized least-squares regression was used with these two variables to determine the equation coefficients and estimates of accuracy for the final equations. 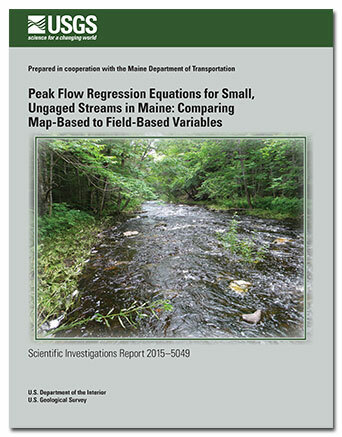 Lombard, P.J., and Hodgkins, G.A., 2015, Peak flow regression equations for small, ungaged streams in Maine—Comparing map-based to field-based variables: U.S. Geological Survey Scientific Investigations Report 2015–5049, 12 p., http://dx.doi.org/10.3133/sir20155049.